The book based on Greg's story, The Silhouette Man (and the student edition, The First Thirty), include an extensive focus on diversity & inclusion as well as a look at the influence of figures like Dr. King & Harriet Tubman on Greg's interest in these topics. The First Thirty was NSDLC Multicultural Relations Book of the Year. Many schools, teams, organizations, & companies have also ordered the books (or companion workbooks) for external use. For instance, the organization that oversees the Golden Gate Bridge ordered copies for students in the Black Student Union at an international school in California - citing the book's emphasis on "building bridges". In conjunction with the school's Alumni Association, The Unity Center at Rhode Island College implemented an edition of The Elevator Project as part of its Diversity Week efforts. The groups that have ordered copies of the book (i.e. for their Shop &/or their students &/or staff) include groups with a diverse range of faiths as well -- from Costa Catholic Academy to the Museum of Jewish Heritage. Other examples of groups using the books &/or workbooks include: Latino College Fair (for 200 teacher, parent & student attendees as take-home gifts), I Have a Dream Foundation chapter (for students), YWCA Greater Pittsburgh Center for Race & Gender Equity (for a women's book club), Toronto Blue Jays (for selected high school students in Toronto), California Milk Advisory Board (for its emerging female leaders program) & the branch of a bank (for students in a race/culture college course in New York). 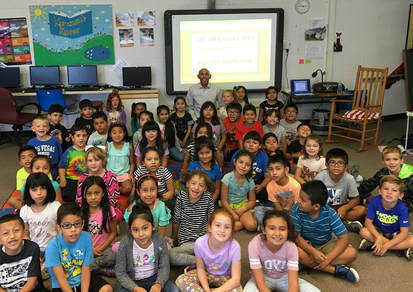 Greg has done readings of The Milkshake Man (the upcoming picture book edition of his story) at events for kids between Kindergarten & 4th grade around the nation -- including an instance where Greg (who studied Spanish in school) did part of the Reading in Spanish for a bilingual class. He also has done Readings for adult learners from other countries. .Greg's art collection, known as My Sleepless Nights, features portraits of historic & contemporary figures like Dr. King, Ms. Tubman, Bayard Rustin, Shirley Chisolm & Simon Wiesenthal. Called a "tribute to diversity" by Art World News, the collection has gone on exhibit at events in different countries. Greg's poem, Legacy, is the basis for the Legacy Poster. The South African Holocaust & Genocide Foundation gave copies of the Legacy Poster to the winners of its art & writing contest. To read Diversity-related feedback, click here.